In the middle of the desert, six kilometres south of Tuna Al-Gabal archaeological site, Egyptian and international media gathered to witness the announcement of a new discovery. 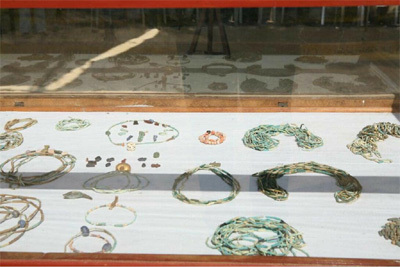 Five showcases displaying the artefacts uncovered from burial sites in the cemetery were guarded by inspectors. 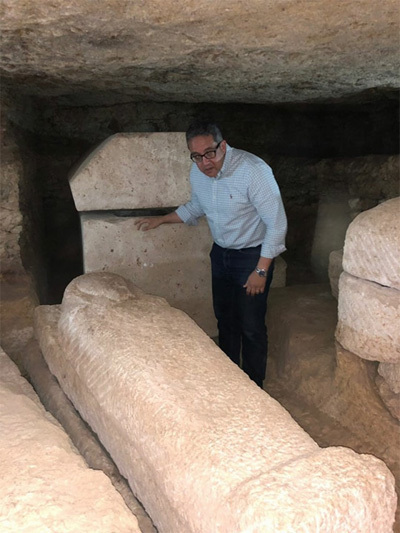 Minister of Antiquities Kaled El-Enany, who was on site, announced the discovery of a 26th Dynasty cemetery that consists of a large number of burial shafts. 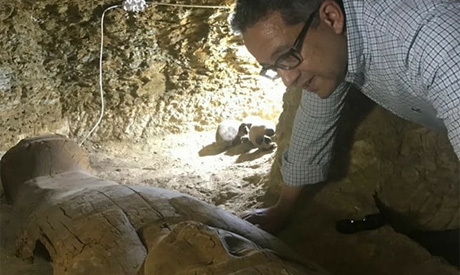 The discovery was made out by an Egyptian mission led by Mostafa Waziri, secretary general of the Supreme Council of Antiquities (SCA), who started excavations at end of 2017. “Excavation work is scheduled to last for five years in an attempt to uncover all the burials of the cemetery,” El-Enany told Ahram Online. He explained that the discovery is still fresh, and many more are to come as excavation continues. Waziri said that in the last three months the mission has discovered a group of tombs and burials that belong to priests of the ancient Egyptian god Thoth, the main deity of the 15th nome and its capital Al-Ashmounein. One the discovered tombs belongs to a high-priest of god Thoth, “Hersa-Essei”. The tomb houses 13 burials in which was found a large number of ushabti figurines carved in faience. A collection of 1,000 figurines are in a very good state of conservation while other statuettes were found broken in pieces. “Restorers are now busy collecting all of the parts for restoration,” Waziri pointed out. He continued that four canopic jars made of alabaster with lids bearing the faces of the four sons of the god Horus were also unearthed. 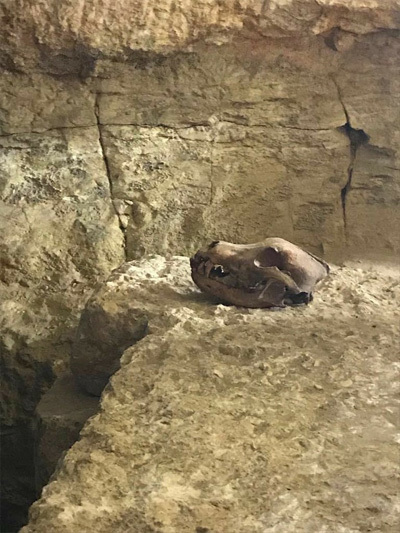 They are in a very good state of conservation and still contain the mummified inner organs of the deceased. The jars are decorated with hieroglyphic texts showing the name and titles of its respective owner. The mummy of high-priest “Djehuty-Irdy-Es” was also found. The mummy is decorated with a bronze collar depicting the god Nut stretching her wings to protect the deceased according to ancient Egyptian belief. It is also decorated with a collection of blue and red precious beads as well as bronze gilded sheets, two eyes carved in bronze and ornamented with ivory and crystal beads. The mission has also unearthed 40 limestone sarcophagi of different shapes and sizes, some of them with anthropoid lids decorated with the names and different titles of their owners. Another family tomb was uncovered in the cemetery, Waziri said. It houses a collection of gigantic sarcophagi of different shapes and sizes, ushabti figurines bearing the names of their owners who were priests of the gods during their time. Other funerary collections showing the skills and art tastes of the ancient Egyptians were also found. Al-Gurifa site was subject to an attempt at illegal excavation in 2002, a matter that led the SCA at the time to start comprehensive excavation work on site in 2002 and 2004 under the supervision of archaeologist Atta Makram. In 2004, the site was declared an archaeological site under the guard of the SCA. In 2017, excavation work resumed to uncover the part of the cemetery of the New Kingdom and Late Period. The cemeteries of the Old Kingdom, First Intermediate Period and the Middle Kingdom were on the east bank of the Nile in Al-Sheikh Saad and Eeir Al-Barsha area. The Ptolemaic period of the cemetery was on the west bank of the Nile at Tuna Al-Gabal.